2011: the year electric cars take off? | What Car? 2011: the year electric cars take off? 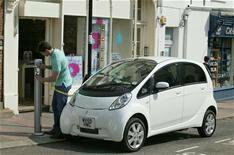 The Government has said 2011 could be the year the electric car takes off. From January 1, car buyers will be entitled to a Plug-In Car Grant of up to 5000 when buying any qualifying car with CO2 emissions less than 75g/km. The Government has revealed which electric cars will be eligible for the grant three are available to buy from January 1, while the remaining six will be on sale over the next 12 months or so. The Government will continue to receive applications from car makers for more cars to be eligible for the grant, and another round of eligible vehicles will be announced next year. Meanwhile, the Government has also revealed the five areas that will receive extra funding to develop and electric car charging infrastructure. The Midlands, Greater Manchester, East of England, Scotland and Northern Ireland will share 20m and will install 4000 more charging points in the coming years. These new zones join London, Milton Keynes and North East England that will install over 11,000 charging posts across the three regions by 2013. 'The transition to ultra-low-carbon vehicles is a great opportunity for the UK motor industry,' said Paul Everitt, chief executive of the Society of Motor Manufacturers.